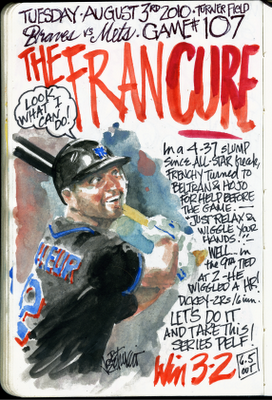 My Mets Journal: Welcome Home Frenchy! JEFF FRANCOEUR HOMERS IN THE 9TH TO GIVE THE METS A MUCH NEEDED WIN IN ATLANTA AGAINST THE BRAVES. HOPEFULLY PELF CAN WIN THIS SERIES FOR US! 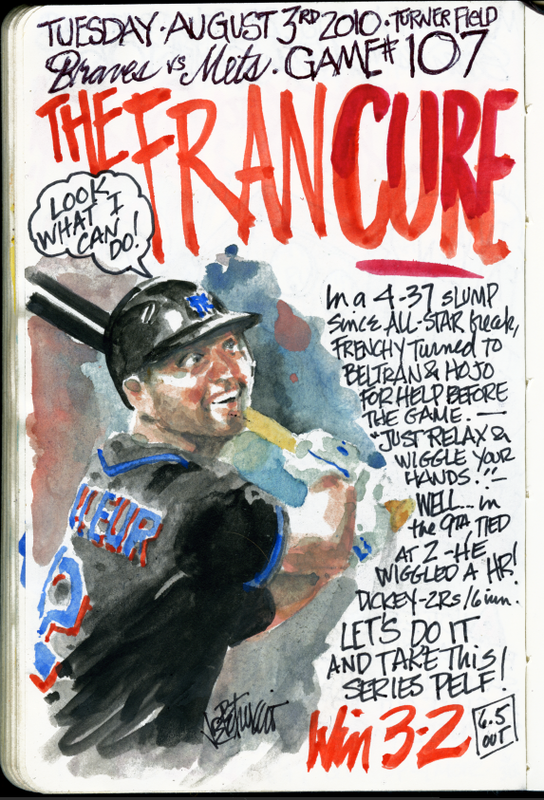 I love Francoeur. This year when he got off to such a good start with the hitting I was hoping that he developed that disciplined eye which would make all the difference in his career. He took pitches; went deeper in counts and even took a pitch the other way now and then. Then he reverted. What a shame. Sadly, Francoeur always forgets why he's been successful for stretches. But the pitchers don't forget he swings at everything and anything, especially on the first pitch. By all accounts he's a good guy and it was a nice moment for him, but he shouldn't be starting on any team that has championship aspirations. Then again, Mets ownership doesn't seem to have those aspirations so I guess it's fitting he's the right fielder. It's true what you both say. I think Frenchy is one of the nicest people I've ever watched play the game. it is too bad his talent level doesn't match his personality level. I do wish him the best and I'm very happy for his successes however few or small they may be. But....ya' neva' know. Maybe he can come up big. Ya' neva' know. Ya' gotta believe!